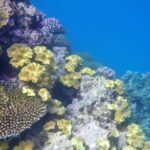 Here is a recent article that contains some more information about the extent: Great Barrier Reef bleaching stats are bad enough without media misreporting. We arrived in Port Douglas about midday Friday, did some shopping then found the backpackers where we were booked for a couple of nights. The room wasn’t ready but we were able to sit by the pool to eat lunch and catch up on emails using their free wifi. The hostel is mostly full of young travellers, which didn’t seem like a bad thing when I first saw the pool contained lots of attractive women in bikinis. The downside however is that it has a bar which is quite noisy until about 1.00am, and the communal kitchen is disgustingly full of unwashed dishes and abandoned food. It is the sort of place where we have to wash dishes and utensils both before and after a meal. About mid-afternoon we thought we better go and explore, so we started following a 4km marked trail around the coast. Before tourism became the dominant industry here the town survived by shipping sugar from the plantations to the north. Thanks to a missing sign we ended up walking a kilometre or so too far along the beach so it was nearly dark by the time we arrived home. 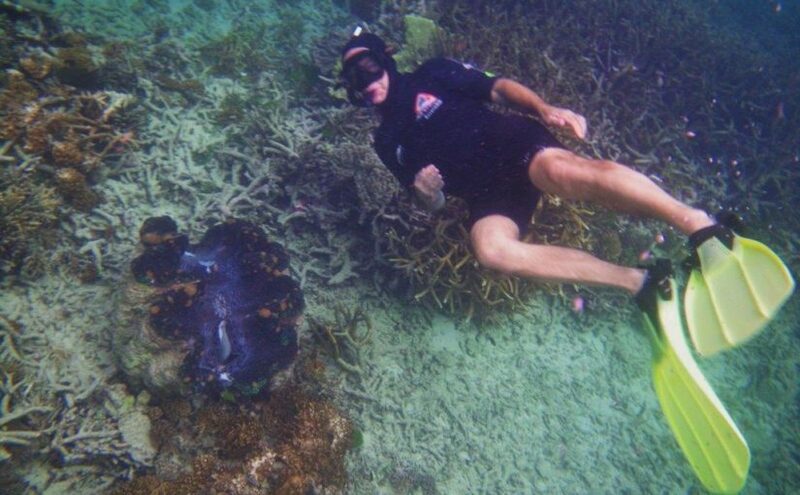 This morning we were up and about well before most of our fellow guests, getting prepared for a day on the outer reef. 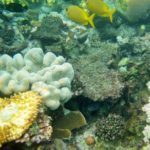 We had expected to be on the Wavelength company’s fast and comfortable catamaran, but we were offered a spot on their older monohull boat which is only used for experienced snorkelers without children. 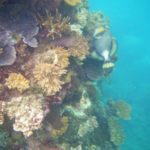 This trip allows for three dives during the day, one of which was a drift dive where the boat stops briefly to get everyone in the water then motors down the reef for a kilometre or so in the direction of the current where the pickup happens. As we boarded, we were introduced to Taylor the marine biologist for the trip, who looked about 18 years old but seemed to know her stuff. The boat spent about an hour and a half taking us almost 50km offshore to Opal Reef for our first dive. 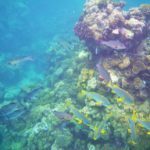 We were very impressed by the number of large sized fish, which are not common in places like Samoa and Thailand where sea life is less protected. 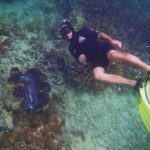 The giant clams were particularly impressive – far bigger than anything I have seen before. 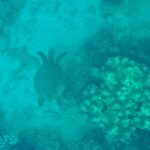 Taylor even found us a rare hawksbill turtle to swim with. The allocated hour passed quickly, but when we got back on the boat there was just enough time to scarf some chocolate brownie and melon before we were dropped off into the water again for the drift. 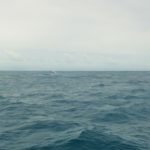 It is a little scary swimming way out in the ocean with no land in sight and just one small boat in the distance to head towards, but most of the time my face was under the water enjoying the amazing scenery. 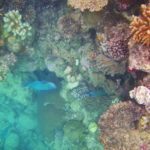 After a delicious and welcome buffet lunch, we motored to Toungue Reef for our final dive. Just before we arrived however, the skipper stopped the boat because there was a minke whale right in front of us. A few of us nipped outside onto the bow for a closer look, and realised it was a mother minke teaching her calf to breach. The minke is one of the smallest of the whale family – this adult was about 8 metres long and the baby a bit bigger than a large human. It was thrilling to see the huge animal launch herself right out of the water. Taylor was screaming and shouting with excitement and apologising for her lack of professionalism at the same time. Luckily for her nobody was shooting a video! 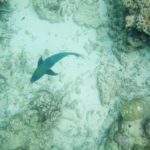 On the final dive we saw a couple of small sand sharks on the bottom. These are only just over a metre long, and not a threat to humans. The dangerous white pointers which do regularly attack people further south don’t come into the tropics because they would overheat. 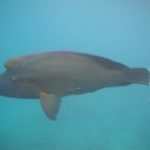 As we swam back to the boat we were joined by a huge Maori wrasse almost a metre and a half long, which I think must have been fed in the past because it was quite happy being within arms length of us. 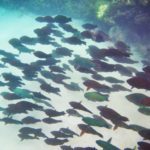 I remember encountering one of these fish when I lived in Cairns back in the 70’s – I had no idea what it was at the time and found myself on the beach with heart pounding before I could even think about what I should do. We had such a good day that we have booked another trip to the reef tomorrow while the weather is good. Today was the best conditions there have been for weeks due to high winds, so we have been fortunate. Awesome! Envious. On my bucket list. am i enjoying another of potts ‘ top blogs Oh Yes ! ! envious ? just a little . thank you john for the entertainment jayemm .